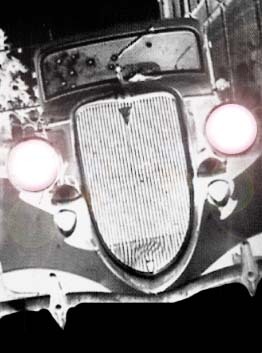 I can tell you that whoever wrote the article on the Bonnie and Clyde car are all wet. I knew Ted Toddy personally and I can tell you the history of this car as written is wrong. The reason I know is my father who is now deceased worked for Ted Toddy from 1951 through 1954 and remained very close to Ted until he died in circa 1980. That was my father's job is he took Toddy Picture's "Killer's All" on tour. Ted had a studio where my father would make head's of the famous murder's of that time. And he would drive the large tractor trailer to small towns with the car and all inside. Many, many times it was nothing to have the car parked outside our front porch. My dad as a young boy ran away and joined the carnival's and was a lover of show business and later for while put on show's himself. It was nothing in those years to have a Sat. matinee at the theatre's that was live and people thronged to see these strange and sometimes haunting and scary objects de' art. And I can also tell you that Ted Toddy used a company in Atlanta for his posters. Ted Toddy was Jewish (unreligious) but a true and kind man however as far as my dad's work, he had little compassion for the hours my father had to put in traveling with "Killer's All" and of course Ted made most of the profit...and with my dad having a pregnant wife and one small baby, plus me and my brother who was around 7 and me 6, he only was able to do that kind of work for about 3 years. amusement type of entertainment fell off. For many years Ted garaged the car.......I still remember the blood stains, and brain matter that was in the top of the car however the bullet holes showed rust on the exterior and the inside of the vehicle had a malodorous odor. My dad Lacy Simmons, or Bill as Ted called him was the one who did the work, Ted owned the car and was the investor for the project. My dad became famous on his own after that and became very wealthy and his work and patents are still viable and his corporation is alive today. I still have the original speakers that Ted gave to my dad that were used for the matinee viewing of "Killer's All". After my dad left, he found a man who was single who was fitted to the position of the carnival atmosphere however it really just lost it's flare for people searching for entertainment. The car was in the movie, "Bonnie and Clyde" with Warren Beatty and then not long ago it was in a recent movie of which at present I can't remember. Ted finally got married to a divorc�e who was approximately in her 50's when they married. Her name was Connie. She had a son that had cerebral palsy and Ted loved him but Connie and Ted were getting old and they have all been deceased since the 80's. I had to correct you on your history as the car could not have belonged to anyone as even when Killers All stopped Ted kept the car in an ole garage out back of him and Connie's home located off Howell Mill Road in Atlanta where they resided until there death's. I personally visited Ted Toddy all through out until he died and I personally saw the car. I'm not sure of the year he bought it but it had to be circa 1948 to 1950.